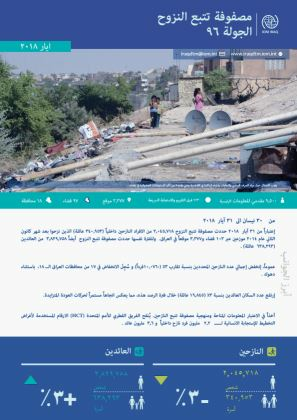 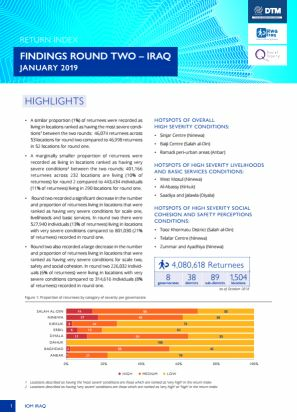 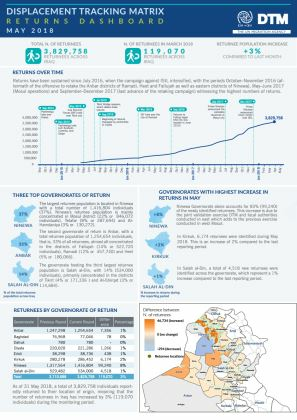 As of 28 February 2019, DTM identified 1,744,980 IDPs (290,830 families), dispersed across 18 governorates, 104 districts and 3,196 locations in Iraq. 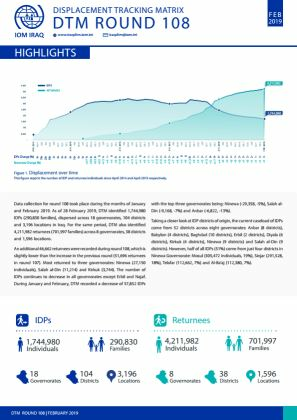 For the same period, DTM also identified 4,211,982 returnees (701,997 families) across 8 governorates, 38 districts and 1,596 locations. 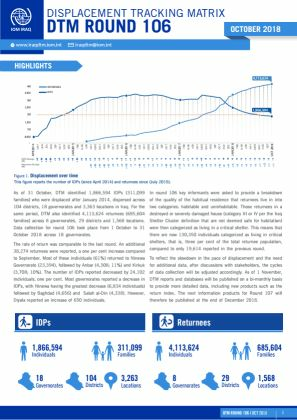 As of 31 December 2018, DTM identified 1,802,832 IDPs (300,472 families) who were displaced after January 2014, dispersed across 18 governorates, 108 districts and 3,214 locations in Iraq. 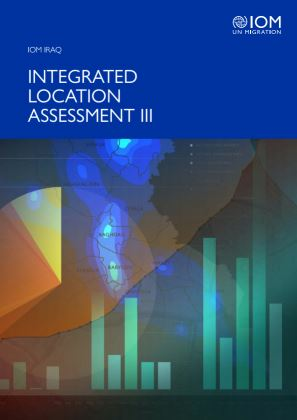 The ILA collects detailed information on IDP and returnee families living in locations identified through the DTM master lists. 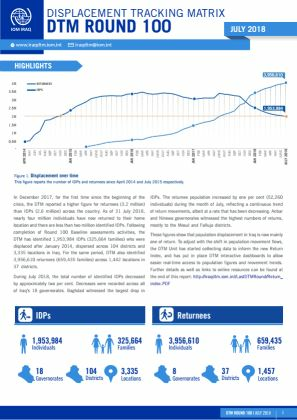 As of 31 October, DTM identified 1,866,594 IDPs (311,099 families) who were displaced after January 2014, dispersed across 104 districts, 18 governorates and 3,363 locations in Iraq. 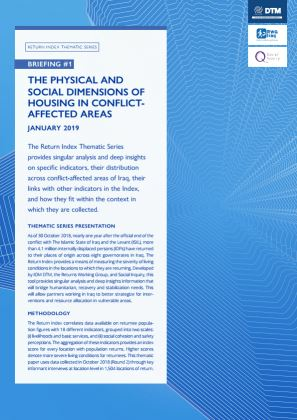 As the ISIL conflict ceased across Iraq, conflict-affected areas in the country experienced an uptick in returns of their internally displaced populations. 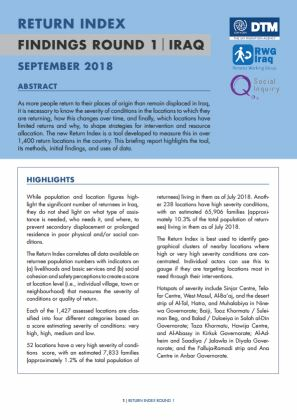 A similar proportion (1%) of returnees were recorded as living in locations ranked as having the most severe conditions1 between the two rounds: 46,074 returnees across 53 locations for round two compared to 46,998 returnees in 52 locations for round one. 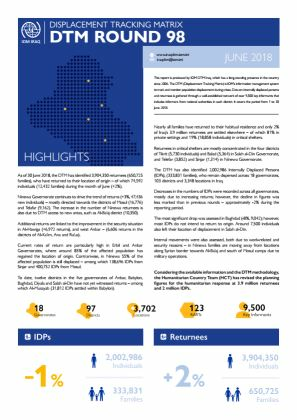 During this round of data collection, DTM has identified 1,920,456 internally displaced persons (320,076 families), dispersed across 18 governorates and 3,325 locations in Iraq. 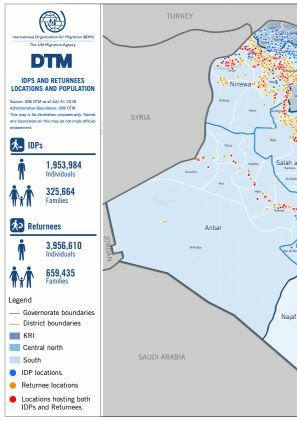 During this round of data collection, DTM has identified 1,953,984 internally displaced persons (325,664 families), dispersed across 18 governorates and 3,335 locations in Iraq. 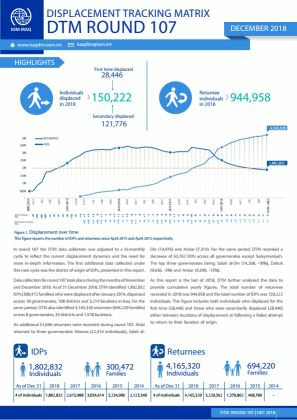 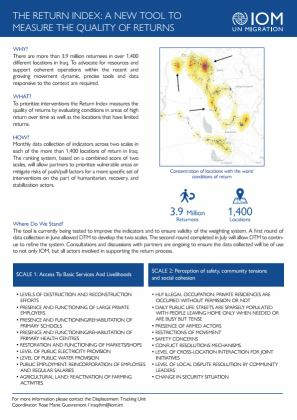 The following map provides an overview of the locations and numbers of returnees and IDPs in Iraq as of July 2018. 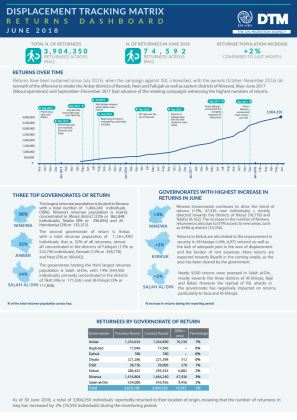 To prioritize interventions, the Return Index measures the quality of returns by evaluating conditions in areas of high return over time as well as the locations that have limited returns. 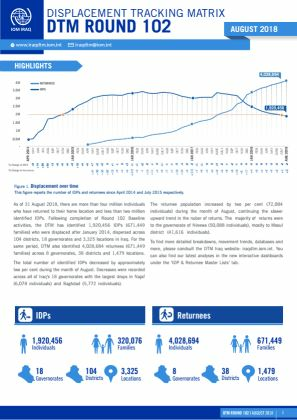 As of 30 June 2018, the DTM has identified 2,002,986 internally displaced persons (333,831 families) displaced after January 2014, dispersed across 103 districts and 3,348 locations in Iraq. 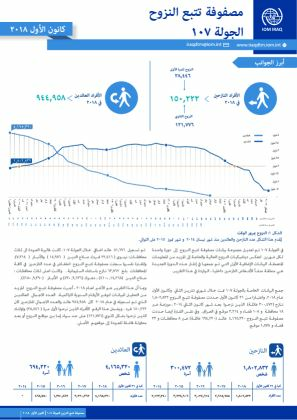 إعتباراً من 31 آيار 2018 حددت مصفوفة تتبع النزوح 2,045,718 من الافراد النازحني داخلياً (340,953 عائلة) الذين نزحوا بعد شهر كانون الثاني عام 2014 موزعين عبر 103 قضاء و3,377 موقعاً في العراق. 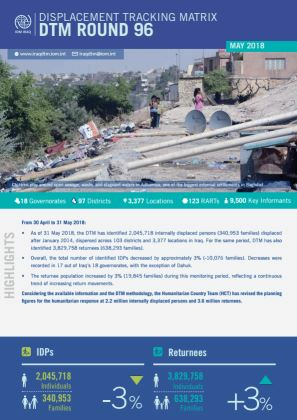 As of 31 May 2018, the DTM has identified 2,045,718 internally displaced persons (340,953 families) displaced after January 2014, dispersed across 103 districts and 3,377 locations in Iraq. 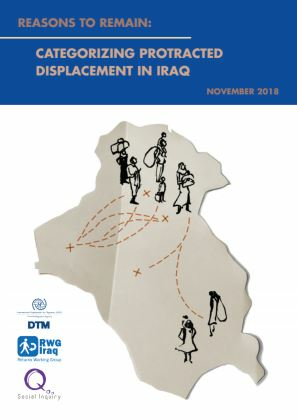 DTM has been monitoring displacement movements from West Anbar governorate, particularly the districts of Ana, Al Ka’im and Ru’a, since January 2017.